"I feel like I'm living out someone else's nightmare." Our story begins with the unexplained image of a fragile doctor (Kiefer Sutherland) looking at his watch, and then shifts to a man (Rufus Sewell) awaking from a nightmare. This guy has no memory of his identity or any recent events, and he discovers a dead, naked woman in his bedroom. The phone rings jarringly. It is the doctor, and he offers a few murky details and warns the man to leave. Dark strangers approach and the confused man flees from the approaching menace. What is happening? As viewers, we're intrigued by this eerie world, but expect the more typical exposition at a story's beginning. This film drops us right into the puzzle and asks us to take the journey. The stylized, utterly confusing beginning sets the stage for Alex Proyas' sharp, mind-bending vision. Dark City originally appeared in 1998 and generated excitement but struggled to find a large audience. Critical responses were all over the map, with some experts loving it while others dismissed it as overstylized junk. One of the champions was Roger Ebert, who chose the film as his the number one movie of 1998. The reputation of this deceptively complex picture has grown tremendously on DVD in recent years. Fans were thrilled to learn about this new director's cut release, which adds 11 minutes to the running time. The added material covers more exposition and enhances the role of several lead characters. Proyas also tightens a few areas, and there are some new effects. The most significant change occurs in the opening sequence, which previously included studio-mandated voice-over narration that gave away key plot points. Those statements have been removed, strongly enhancing the perplexing atmosphere. The man discovers that his name is John Murdoch, and he's suspected by the police as a serial killer. His wife (Jennifer Connelly) reconnects with him, but their relationship seems tenuous and shallow. In fact, the entire city appears to exist in a hazy dream state with little direction. The structures are grand and impressive, but the environment is claustrophobic and dreary. Where is the sun? Everyone remembers a mystical childhood place called Shell Beach, but no one seems to know how to get there. Does it still exist? The solution almost certainly lies with the Strangers, a strange group lead by the creepy Mr. Hand (Richard O'Brien) and the authoritative Mr. Book (Ian Richardson). Their powers and understanding go well beyond the typical citizens, but few people even see them. Murdoch is a rare exception, but even his limited knowledge might not deliver the expected answers. Alex Proyas gained major acclaim in 1994 with the release of The Crow, which became a surprise hit and spawned a series of sequels and a television show. That film showcased his ability to craft engaging shots in the darkest locations. His skills are even more on display in Dark City, which contains a wondrous visual style. The locations recall a wide array of architectural influences, most notably from the 1940s but also from later decades. The material pulls strongly from the film noir genre, with its bleak city and mysterious direction. In similar fashion to a classic detective story like The Big Sleep, we remain in the dark along with Murdoch. The final revelations about the nature of the Strangers are news to us and the main characters. While the obvious genre classification is sci-fi, it only represents part of the overall structure. This blending of genres could also explain the lack of success at the box office, where many viewers prefer movies with a singular approach. Instead of following a tidier route, Proyas pushes the envelope and crafts a first-rate picture. Another hurdle for viewers to overcome is the mostly staid acting, particularly from the usually lively Jennifer Connelly. Her character is very bland, but it fits with the film's overall premise. Rufus Sewell is more confused than heroic, which makes it harder to identify with him. Once again, however, this acting style fits the story and becomes stronger with each successive viewing. Johnny Depp and Tom Cruise were both considered for the role, and either would have crafted a much different picture. The supporting characters more than compensate for the sober lead figures, especially the creepy Richard O'Brien. Showcasing a range that's rarely seen in his post-24 roles, Kiefer Sutherland channels Peter Lorre as the abnormal doctor and still makes him sympathetic. 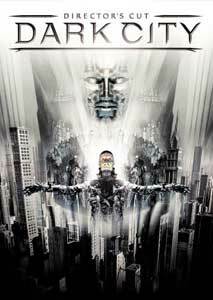 The postmodernist themes of Dark City seem more common today, with much credit due to the Matrix trilogy. Specific moments directly recall Proyas' film, with the final confrontation starting eerily similar to the Neo/Smith battle at the end of The Matrix Revolutions. Those pictures (mainly the inferior sequels) crank up the action and lose the subtlety displayed here. Dark City does have a few flaws in pacing and falls victim to conventional action clich�s, but the negatives only slightly detract because the overriding themes remain powerful. Also, the remarkable set design instills specific emotions and exemplifies Proyas' confident direction. His sharp focus and the script's complex ideas make this film a must-see if you�re aiming beyond the typical multiplex fare. Image Transfer Review: This brand-new 2.35:1 anamorphic widescreen transfer of Dark Citybeautifully conveys Alex Proyas' original vision. The claustrophobic interiors and stunning cityscapes look better than ever and truly immerse you in the action. Although nearly every scene occurs at night, the picture lacks the fuzziness that often appears in darker sequences. Particularly strong is the Strangers' underground setting, which conveys a grand scope that would be missed with an inferior transfer. Audio Transfer Review: This release also provides an excellent 5.1-channel Dolby Digital transfer that heightens the intensity of the action scenes. This story needs the atmosphere created by the surround speakers, and the audio succeeds masterfully. It's not an extreme, booming mix, but remains consistent through the film. The depth serves Proyas' vision and draws you into the mind-bending experience. Extras Review: Dark City: Director's Cut includes an enjoyable group of extras, highlighted by several excellent documentaries. Memories of Shell Beach offers a 43-minute look at all the key elements. Alex Proyas and writer Lem Dobbs discuss the genesis of the story and working together to improve it. We also hear from writer David Goyer, who joined the team to handle some re-writes. Another exciting part of this feature is the focus on the influences driving the predominant styles. They also give a notable look at how miniatures were used to create some of the most impressive scenes. The second part covers the unfortunate reactions from critics and audiences, which is sad, but it does have a happy ending. The other major entry is Architecture of Dreams�a 33-minute collection of short visual essays on more intellectual topics. One of the more extended segments is "Worlds Constructed" by Professor Dana Pollan, which compares Dark City to Edward Hopper paintings. Another intriguing item is "Cities as Spectacle and Collective Memories," involving both Dobbs and Roger Ebert and speaking about the unique house of Sir John Soane. The other stimulating inclusions are three new commentaries from Proyas, Ebert, and the combination of Dobbs and Goyer. It's intriguing to hear from the director and writers, but my choice for the best is Ebert's track. His conversational tone allows him to present cerebral issues without sounding haughty. Ebert gives compelling details on how film is composed and really understands what film lovers expect from a commentary. He also appears in Alex Proyas' DVD introduction, which lasts for about five minutes and quickly describes the new version. If you want even more, the production gallery has 80 color photos showing the actors and crew during shooting. Plus, computer users can download a digital version of the movie to watch in a different medium. I'm generally skeptical of "director's cut" editions because they seem designed to fleece movie lovers with the promise of a few extra minutes. Thankfully, this extended version of Dark City includes enough new material to warrant another DVD. Exciting new footage, impressive extras and a reasonable price make this a worthwhile release.